"Its good tuition for all students here teaches a good method. That is study with creativity. Its helps to everybody. " 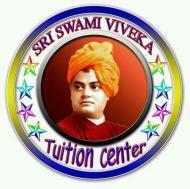 Sri Swamy Viveka Tuition Center conducts classes in Class 10 Tuition, Class 6 Tuition and Class 7 Tuition. It is located in Ammajipeta, Tuni. It takes Regular Classes- at the Institute. It has got 1 reviews till now with 100% positive feedback.